"God will tell us the way to go (see Psalm 37:23), but we have to do the walking. A walk with God develops by taking one step of obedience at a time. Some people want the entire blueprint for their lives before they will make one decision. God does not usually operate that way; He leads us one step at a time. By faith, we take the step God has shown us, and then He gives us the next one. At times, we may fall down and must get back up; we may stumble, but He always helps us. We continue on by His strength and His grace, knowing that every time we face a fork in the road (a place of decision), God will guide us." Verse 24 of that same Psalm reads, "Though he falls, he shall not be utterly cast down, for the Lord grasps his hand in support and upholds him." Wherever we are in life, whatever our past, whatever our present situation, and whatever our future -- God has it under control. The bible tells us, in no uncertain terms, that when we put God first in our lives, everything else will, indeed, fall into place. Time and again, we've heard the verse telling us to seek first the Kingdom of God, and all the rest will be added to us. It's not just a catch phrase, you know. It's a monumental truth that we have a difficult time grasping because of our need for control. What if we COULD just sit back and relax? What if we had someone who would bear the burden of the responsibility and we could trust them completely to handle each and every situation, good or bad, that came our way? Well, we do. It's on us, however, to trust and follow. My mother used to tell me that my conscience would guide me, step-by-step, and that if I listened and followed what I knew I was supposed to do, that little voice would get stronger and I'd more easily know the right response in every situation. She also warned me that if I ignored that voice, it would grow weaker day after day, and there would come a time when I might not be able to hear it at all. The woman is usually right, and this was no exception. There was a point in my life when I absolutely knew the right thing to do, and I did the opposite. Time and again, I'd defy what I knew to be the promptings of my conscience (read: God!) just because I wanted to be in control. What I found out after many years of doing that is that God is so good, He will let us make that choice. He will not force us to listen. He will allow us to be in control of our own lives. I also found that when I'm in control of my life, I do nothing but make a big, fat, ugly mess of it because I don't have a beautiful vision for the future. Humans are junkies for instant gratification. We want what we want, and we want it right now. We don't think through what the repercussions might be or, if we do, we don't care and we do things we shouldn't anyhow. The result is said big, fat, ugly mess. Emotionally, sometimes physically, and always spiritually. 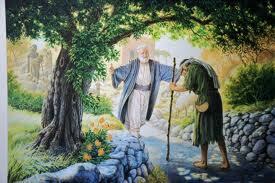 There's a beautiful parable that Jesus told about the Prodigal Son (Luke 15:11-32). Basically, a man has two sons, and one of them is a selfish jerk who demands his inheritance, leaves his family, squanders everything he has, makes a plethora of terrible decisions, ends up broke and hungry and hurting and finally realizes that the only safe place is back home in his father's arms, but he's afraid of what dad might say. What he finds is that his father is so good, so loving, that he doesn't even get a lecture when he comes home. He gets a celebration, the likes of which hadn't been equaled. His father loves him unconditionally, regardless of his failures, his rebellion, his selfishness. And he is not just accepted at home, he is embraced full-throttle by his father who comes running at him when he sees his son far away. The moral? God loves us so much that it doesn't matter what a mess we've made of our lives. When we're ready to throw in the towel and admit we can't do it all on our own, when we're ready to stop trying to control everything, He's there. He's there waiting, running towards us with His all-encompassing, unconditional love, even when we don't see Him over the hill. Take a breath. Take a step in the right direction. You'll be surprised at how quickly you'll be embraced. I have a buck and seven cents in change roaming around my car. That buys any number of things from a dollar menu at a fast food joint in Indiana. (Depending on what state you live in, the seven cents could be a penny or two more or less, but the dollar menu price remains the same.) I know that I don't have the ability to take a homeless person out to a nice meal because I don't have the ability to take myself out to a nice meal. But I drop a dollar seven like it's nothing most of the time. 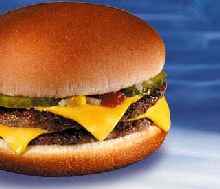 Wouldn't be too difficult to buy a McSomething and hand it over to McSomeoneElse. That's one small thing we can do. I have 24 hours in each day of my life. Granted, I'm a pretty busy person with a husband, three kids, two dogs, two jobs, an involvement with community theatre, and a non-profit organization to get off the ground, but there's got to be an hour a week (or even a MONTH) where I can say, "This hour belongs to someone else. I'm going to donate this hour to help paint, clean, teach, sew, babysit, volunteer..." and then use that hour to make a difference in the life of someone else. Whether it's stocking at a food pantry, watching a toddler so a single mom can go to a job interview, serving at a soup kitchen, moving furniture into someone's first apartment -- I can help make it happen. And, if I'm honest with myself, I can probably do it for two or three hours instead of just one. That's one small thing we can do. I try to take a walk pretty often, sometimes even once a day. I see a lot of trash on the side of the road, even in my small subdivision. I get annoyed, but it's there every day. Someone should clean it up. It's probably not going to be the person who tossed it out their window. It's not too difficult to sling a re-usable bag or two over my shoulder and pick up plastic bottles, aluminum cans, candy bar wrappers and fast food bags, then put them in my trash and recycling when I get back home. Plus, the bending is likely good for my abs. That's one small thing we can do. Who doesn't love the great big price rollback store, am I right? Where they put one or two items in your thin plastic bag, then double bag it so it won't fall through, and when you purchase five items you come home with approximately 37 bags? Not too hard to take a re-usable with you and ask the cashier to put your items in there or even use the self-checkout so you can do it yourself. And I know it's 2013 and we're not living in those days where we help sweet little old ladies with their groceries... but... what if we did, anyway? What if we actually returned our cart to the corral? Or someone else's that 'forgot'? What if we smiled? What if we didn't glare angrily at the screaming infant in the cart or the three-year-old that's jumping up and down begging and throwing a tantrum for a candy bar but, instead, let the mother know we have compassion? What if we didn't tap our fingers and roll our eyes when the cashier doesn't get the scanner to work right on the first two tries? What if we thanked everyone for everything they did for us? That's eight small things we can do. No one can can change the world. False. No ONE can change the world. True. There's a very small word that puts everybody together in the same boat on this planet: we. WE can change the world. WE just have to do it together. You don't have to be a Christian to be a good person. Oh, yeah. You see, A Journey of Reinvention, though faith-based, is not on a mission to shove Jesus down anybody's throat. We do what we do because we love people, and (in our minds) we love people because Jesus loved people. 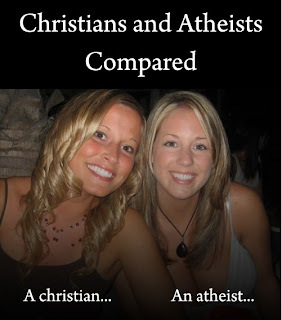 But there are a fair number of atheists in our lives and -- spread the word -- they're not evil. They're human beings just like everyone else and deserve love and respect, friendship and companionship. Put aside any agenda to 'save' someone (since, ya know, we can't save anyone anyhow...) and just love people. All people. So, you and I might believe in God and Jesus and Heaven and all the spiritual stuff that we align ourselves with that is integral to who we are. If that's your paradigm, then doesn't it stand to reason that the God we believe in loves people who don't believe in Him? Since He created them in His image just like He created us? And have you ever wondered what keeps atheists being atheists? I'm sure hypocrisy doesn't help. It certainly didn't help ME when I renounced my faith in Jesus and God for a decade. If we're claiming there's a God out there that loves everyone equally and then WE don't love everyone equally, surely that's not helping us plead our case. But I digress. A Journey of Reinvention is about helping and loving people, yes. Do you have to be a Christian to love and help people? Nope. (Stop gasping, it's throwing me off.) Do you have to believe in God to love and help people? Nope. Do you have to be a Christian or believe in God to focus on sustainable living solutions, or to feed hungry kids, or to teach interview/cleaning/hygiene skills to those in need? A resounding 'NOPE' once again. We're on a mission, yes. We're living missionally, yes. We're trusting God, having faith, loving people, yes. But no one ever becomes part of the Journey until someone else invites them, right? We're a safe place with no judgment and no exclusion here. Be sure to tell that to your friends, whatever their beliefs may be, when you invite them to be a part of something bigger than all of us. My husband told me today that I should write a book on the book of Romans. I agree wholeheartedly. I find amazing tidbits in there each time I sit down to read it, and it's so very appropriate to so many situations going on in my life all at the same time. The overwhelming message, though, is love. And that's what I keep coming back to on this page in the first place. Why? Because it's all that matters. If you're doing 'good deeds' out of a desire to be praised, out of an internal duty to cross things off of a checklist, out of a need to look good in front of others, and you don't have love in your heart, then all the good deeds in the world are meaningless. (Okay, granted, that's in the book of Corinthians, but there are echoes of it in Romans as well.) Take chapter 14 of Romans, for instance. On the surface, it looks like a bunch of rules you can break if you want... it's about whether or not one day is more important than another, or if eating meat or vegetables is better in God's eyes. But the point that Paul is trying to make is this: whether you believe one way or the other, be convicted of it. Don't be wishy-washy. And if you encounter someone else with a different conviction, don't tell them they're wrong... that's not your place. Your place is to respect their beliefs and be a good role model. Let's say you are a carnivore and you go to eat at a vegan's house. Are you going to chastise them for their choices, or are you going to thank them for the meal and be grateful that they cared enough about you to invite you over? Or, if a close friend of yours is against drinking... are you going to invite them to a party and then serve so much alcohol that the rest of the party-goers are drunk? The more mindful we are of the feelings of others, the more mindful we are of our purpose here on earth. When we're so immersed in what we want, how we live, what we do... we can't get out of our heads and into the hearts of others. I used to smoke. A lot. I loved it. I miss it. I don't think it's evil or that it's sending anyone to Hell. I think it's unhealthy, but I certainly don't judge those who make the choice to do so. Smokers are welcome at my home. They can smoke on the porch, in the yard, in my car. Why? Because I think smoking is a good choice? No, because I think investing in people is a good choice. If I sit with someone while they smoke a cigarette, and they tell me their life story, it's time well-spent, even if I spend the rest of the night coughing after they leave. I know better how I can help them in their Journey. If I say, "You can't smoke here," because I don't smoke, I might have just cut off a bond that could've been a lifelong friendship, or the chance to really make an impact on someone's life. Forcing our beliefs on others is NOT what we're here for. Loving them is. The same is true in the opposite direction. If I like to have a glass of wine with dinner, and I've invited a recovering alcoholic to my home, am I going to drink my nightly glass of wine in front of her? Or am I going to partake of something we can both share? What might be no big deal to me could present quite the stumbling block for someone else if my focus is not in the right place. Again, it's about loving people enough to put their needs ahead of our own at each and every level. Not just when we feel like it, not just when it's convenient. At every juncture, always. He loved us enough to die for each of us. What we must realize is that a life of peace does not rely solely upon us, but it certainly begins there. It's in the choices we make, in the actions we take, and in the reactions we have. 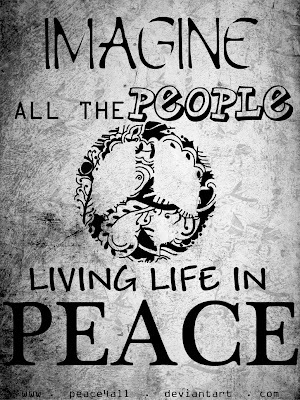 It's pretty easy to live in 'peace' if you're alone -- there's no one there to disagree or argue with, to look down upon, or to prove wrong. But whenever a second person enters the picture -- be it a friend, enemy, spouse, colleague, relative, or stranger -- there is always a chance for strife of some sort. As with all things, the trick is to stop trying to put ourselves first. It's the re-training of a lifetime, but well worth it. When we're born, everything centers around us. Our world is a festival of 'me'. I want, I need, give me. The problem is that not everyone grows out of that phase; it just becomes deeper and more invested than it was originally. Soon, 'I need a diaper change' becomes 'I need a PS4', then 'I need a brand new car', then 'I need a mansion in the Hills'. 'I need a warm bottle' becomes 'I need a $6 latte and I really don't care if you were here first, so I'll step ahead of you and not tip my barista'. It's when we step outside of ourselves and see the world through the eyes of the Creator that things really become apparent. The realization that our earthly status means precisely CRAP is a bit rattling at first. God does not care how much money you make, what you drive, where you live, or how you dress. He doesn't care if you have a $50 manicure or you bite your nails until they bleed. What He cares about is how you're showing His love to everyone around you. This peace we can have is not just internal (though that's certainly a large part of it.) If we are filled with a humble spirit, a generous nature -- if we look at everyone we meet as equal to ourselves regardless of whether or not we like them -- it becomes easier and easier to practice this peace. If someone offends you, your first reaction is often to rail on them, go into an angry tirade to their face, then talk about them behind their back. If someone says something hurtful to (or about) you personally, your first reaction is usually one of emotional recoil, mistrust, then anger and bitterness. Our lives and our reactions are very emotional and in-the-moment, regardless of how logical we deem ourselves to be. What if we stopped living off of pure emotion and began training our responses to be... well, better? Just as Paul writes in Romans 12 to be constant in prayer, what if our FIRST reaction were to pray? Right there, right when it happens? Maybe not out loud, maybe not on our knees, but a quick whisper inside our head for God to lead us down the right path. For our reactions to show His love and not our emotion? For the way we handle the situation to honor Him and not be something we might be ashamed of in fifteen minutes? What if, instead of trying to handle everything ourselves at every juncture, in every circumstance of our lives, we asked Him what to do first? Growing up, I had a very good relationship with my parents and I was, for the most part, a pretty 'good' kid. But anytime I was counseled by my mom or dad to do something, my gut instinct was to do the opposite. "I'll do what I want" and "You can't tell me how to live my life" seem to be the reigning mantras of every teenager I've ever encountered, including myself at that age. The thing is, though, looking back? 99% of the time my parents were right. That's a pretty big percentage for human beings. And I often wonder, had I followed their advice all of the times I DIDN'T follow their advice, how would my life have been different? Better? More peaceful? Happier? As I grew older, I began calling my parents almost every single day. I'd ask advice and then take it. Their wisdom and experience has never failed me in my adulthood. 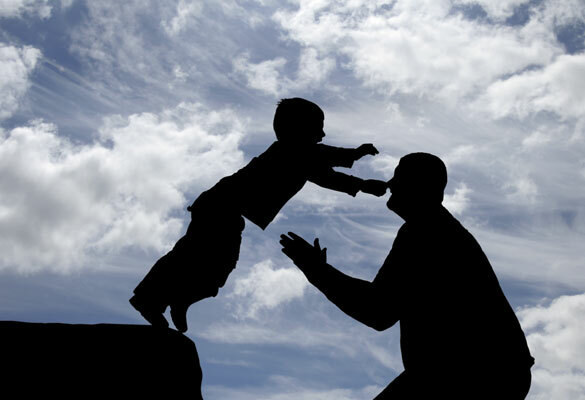 And, as I grew even older, my first 'call' became to God -- the parent who is 100% right all the time. I retrained my thought process. I am happier and more at peace now than I ever have been in my lifetime. His advice is never inaccurate, and when I seek Him first in every circumstance, I find myself with the patience, the endurance, the peace to get through any situation I'm dealing with. If our first response is to go to God, His first advice will be the peaceful solution. 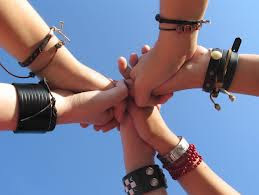 As far as it depends on us, we are to do everything on our end to be peaceful with others. If their actions and reactions are not peaceful, there's nothing we can do about that but pray. And pray we must! Just as you grow closer to another human being through more frequent contact, the same is true of our relationships with God. Talk to Him more. Listen to Him more. Call on Him more. 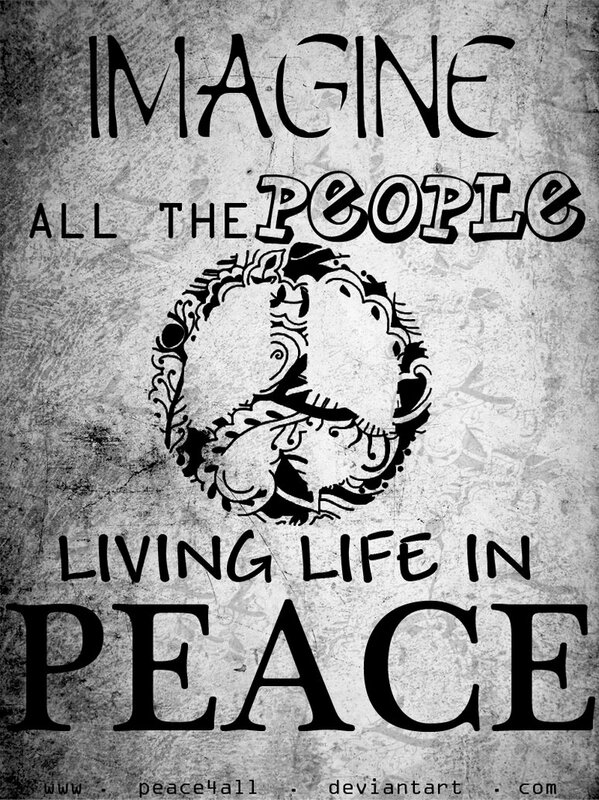 The peace that results will be worth more than any car or mansion you could dream of. What Do You Wanna Do With Your Life!? I just want to help people. I wish that were a job. I wish I could get hired to help people. I wish helping people paid $20+ per hour, or some sort of livable salary at least. Sadly, helping people is what most of us do in our 'spare time'. And, these days, who has spare time? We volunteer an hour or two here or there, maybe give blood once a year, stop to help someone fix a flat on the side of the road perhaps once in our lifetime (if we're not in too big a hurry). Then we feel good about ourselves because we did a good deed. And there's nothing wrong with that, really. We're busy people with busy lives and a lot on our plates. It's just that it takes more than that to change a life. And even MORE to change LIVES. So the big question is, is it possible to make 'helping people' my full time job? The answer, of course, is an emphatic 'yes' as that is, indeed, what WILL happen... eventually. But have you ever been so excited about something that's going to happen eventually that you want it to happen right now!? As though you cannot possibly wait another minute? Maybe a trip to Disney, planned six months ahead of time, gets you wishing on a daily basis "Why can't it be tomorrow!?" Or, in the process of an adoption, when you're waiting for months... "Why can't our child get here today!?" The level of excitement inside is overwhelming to the point of being unable to concentrate properly. Ideas, brainstorms, plans, conversations, lists, and all the rest of this phase of development bounce around in my brain like a pinball in a machine, and I just want to be further along than I am. All that simply means is, it's time to sit back, take a breather, do some writing, get organized, and keep going. I'm terribly logical, it's just a matter of listening to my own advice that gets me stuck. 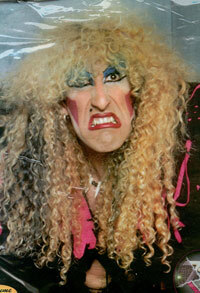 Maybe I'll pin up a picture of Dee Snider as a motivator? For now, as I make my lists, work with the other ministry partners to solidify a more exact idea of where we're going and how we're going to get there, please feel free to get the Journey out there on social media so we can be ready to launch our next leg as soon as possible! I'd love to regale you with a few notes about faith today, if you'll permit me. You've read this far, so you're locked in, right? Here's the thing: there's a difference between living by faith and being an idiot. (What!? Yes.) Faith is not jumping in front of a moving car claiming it won't harm you because God's going to take care of you. That's being an idiot. Faith is also not throwing yourself off a cliff claiming that God will give you wings. Also being an idiot. Jesus knew better than that when the devil tempted Him in the wilderness, and so should we. Matthew 4:5-7 describes it as the bad guy on the pinnacle of the temple with Jesus, telling Him to throw himself down and that if He is who He says He is, the bible says that the angels will not let Him come to harm. Jesus says the bible also says you're not to tempt the Lord your God. So what does this translate into for us? The more connection we have with God, through prayer and reading His Word, the more able we'll be to discern the difference between living by faith and being an idiot. (You love my colorful language, don't you? I speak only truth, my friends!) We'll also be better able to discern the difference between what we want to do (living by our feelings) and what God is calling us to do (living by faith). Romans has been my favorite book of the bible for quite awhile now. There are some scriptures in there that people love to debate and sit upon as their basis for their personal bigotry, sadly, but if read in context those people would understand that they are completely wrong. (Further proof that you should read things for yourself as opposed to just listening to what other people say 'the bible says'... anything out of context is useless.) However, there is so much beauty in the words about faith that, at least in my opinion, can't be contested. (Hah! Everything can be contested! Also, I love parentheses.) Romans 3 talks about our reliance on faith, not on the letter of the law. It does not scoff at the law -- Jesus even said He did not come to nullify the law, but to fulfill it (Matthew 5:17) -- but because of His sacrifice on our behalf, we are set free from death each and every time we fail. Our faith in Him alone restores us into right standing with God. We don't have to be perfect, thank God. The thing is, the more faith we have, the more we want to do the right thing. And, when we see the good and fruitful results of doing the right thing, we have more faith. It's a great cycle. Cycles can go the wrong way, too. If we do not have faith, if we spend our lives on little details, criticizing, judging ourselves and others, attempting perfection and always failing, we have less faith. We think of our lives as a series of merits and demerits. We think, "I did this wrong, so God loves me less. I did this right, so He loves me more." It's not a point system, believe me. God doesn't love you more if you give $2 to a homeless woman on a streetcorner or less if you run your wheels through the puddle and splash her with mud. He simply loves you. And living in that love, having faith in His ability to guide you along the path He has set out for you on this Journey, that places a freedom inside you like no other. The freedom to do good things simply because they are RIGHT, and not because you feel you have to for score-keeping purposes, or to prove to God that you're good. You're not. None of us are. HE IS, so we can live by faith in that, and have a peace and joy that passes understanding. Speaking of that peace that passes understanding, I have never felt more peaceful than I do right now. If you've kept up with the blog, you know I quit my main job recently which was our primary source of income, because I felt led to do so and, by faith in God and His plan, took the next step. People do not seem to understand -- they fear for my well-being, our financial security, and more -- this peace I have in knowing that it was the right decision... yep, it passes understanding. Don't forget, there are great big, GOD-big plans coming the way of this Journey, for all of us. Never forget Jeremiah 29:11. He has plans to prosper us, to give us a hope and a future. And that hope and future is coming closer each day by faith alone. You can now WRITE to us by clicking HERE! Ask questions, make observations, tell us what you like and don't like about the blog, what you're learning, what you agree or disagree with. We want to pray for you, so please be specific about your prayer requests and know that you're on our hearts! We want to hear it all. We're all a part of each others' lives, and we couldn't be happier about that! (Stop that laughter. I know what you're thinking. I meant ACTUAL problems, not 'this chick is crazypants' problems.) I'm fearful of a little phrase that was ever-so-commonplace a few years ago and is still spouted from time to time even now. I'm fearful of it because I don't think many people really understand the repercussions of it. But I also have found that fear is of no use -- understanding is. Are you ready? I agree that we should ask ourselves that question on a regular basis, but I don't think it should be a catch phrase. Instead, we need to have some real introspection into the design for life that Jesus left us. We shouldn't be so quick to place our ideas of what we WISH Jesus would have done into the mix. We need to step back and take a good look at the books of the bible that actually discuss His actions and His words, and base our plan of action upon the words we read. Another way to go about it is to look at the question 'What WOULDN'T Jesus Do?'. I'm not talking about 'Well, He didn't get married, so we shouldn't do that..." I mean the across-the-board connotations, here. If He is to be our role model for how we're living our lives on a daily basis, then surely it would behoove us to analyze what He did and did not do. John 3:16 is so well-known I don't even have to recite it. But the very next verse should go hand-in-hand with it. 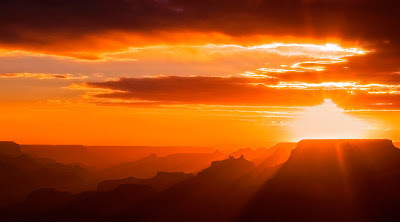 John 3:17 says, "For God did not send His Son into the world to condemn the world, but to save the world through Him." That's a pretty powerful statement in and of itself, right? If anyone had the authority to condemn someone else, it was the sinless Jesus, the Son of God. And yet, that was not His mission in life, so it should certainly not be ours. His mission was to save the world. Our mission should reflect that, as well. We are not the ultimate sacrifice, we are simply sinning sojourners who are all saved by His sacrifice. How does that translate into our mission here on Earth? We live our lives differently. I don't mean we should abstain from 8 million different things and then make people feel badly if they don't abstain. That's not part of the plan. We're just supposed to love one another, regardless of flaws and failures, and do what we can to point others in the right direction. Mark 2:15-17 shows His mission in a nutshell. Basically, Jesus and His disciples sat down to eat with a bunch of 'sinners' (so deemed by the ever-phun pharisees, leaders of the law) and those pharisees pretty much flipped out that He would do such a thing. Jesus said right back to the pharisees, "People that are healthy don't need a doctor. The sick do. I'm not here to hang out with the righteous, I'm here to call sinners to righteousness." 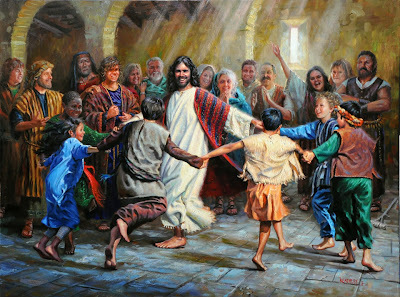 So it begs the question, if all we do is go to our happy, safe little church, with our happy safe little church people, and we spend an hour or two singing and eating and listening... then we go back to 'real life' and keep ourselves what others might deem 'above reproach', who's being helped? What lives are being changed? How is our mission being furthered? How is the Word of God being taught to anyone that might need to hear it? The assumption is, if we're already going to church on a regular basis, we know what we need to know. Just as a body, though one, has many parts, but all its many parts form one body, so it is with Christ. For we were all baptized by one Spirit so as to form one body -- whether Jews or Gentiles, slave or free - and we were all given the one Spirit to drink. Even so, the body is not made up of one part, but of many. Now if the foot should say, 'Because I am not a hand, I do not belong to the body,' it would not for that reason stop BEING part of the body! And if the ear should say, "Because am not an eye, I do not belong to the body,' it would not for that reason stop being part of the body. If the whole body were an eye, where would the sense of hearing be? If the whole body were an ear, where would the sense of smell be? But, in fact, God has placed the parts in the body, every one of them, just as He wanted them to be. If they were all one part, where would the body be? As it is, there are many parts, but one body. The eye cannot say to the hand, 'I don't need you!' and the head cannot say to the feet, 'I don't need you!'. On the contrary, those parts of the body that SEEM TO BE WEAKER are indispensable, and the parts we think are less honorable, we treat with special honor. And the parts that are unpresentable are treated with special modesty, while our presentable parts need no special treatment. But God has put the body together, giving greater honor to the parts that lacked it, so that there should be no division in the body, but that its parts should have equal concern for each other. If one part suffers, every part suffers with it; if one part is honored, every part rejoices with it. Now YOU are the body of Christ, and each one of you is a part of it. At first glance, it's as though He's taking to 'We Christians', right? But did you notice a few things... Jew, Gentile, Slave, Free... some parts seem to be weaker, less honorable, unpresentable... YOU are the body of Christ? He's talking about ALL of us. Every human on the face of the planet. We can't pick and choose who gets in and who doesn't. It's not a mean girl clique, this whole 'Christianity' thing. You don't have to be presentable, or fixed-up, or shiny, or perfect, or sinless for Jesus to love you. Because, newsflash: NOBODY is. We're all a bunch of sinners, with no degree of separation between someone who fantasizes about embezzling money from work and someone who actually murdered their boss. So our mission in life, as the body of Christ, is not to decide who we want to love and who we don't, nor is it to judge who is best fit to join in and who's not. Treat those who are NOT yet believers with honor! Go out of your way for THEM. Let THEM know they are loved! Serve one another. If you truly want to ask the question "What would Jesus Do? ", also ask yourself what He wouldn't do. He wouldn't make anyone feel less-than. He wouldn't tell you that you have to be better for God to love you. He wouldn't hide His head inside a church (or a synagogue) and never meet anybody new. He wouldn't judge or condemn people for their sins. He would simply love God and others, live humbly, be Himself, and be something so different among the world that, over two thousand years later, people still can't stop talking about Him. What holds us back from being everything we want to be? Circumstances can play a big part. We often feel as though, if we had more money, we could accomplish our goals. If we had a better job, we could have a higher rank and, thereby, get further in life. If we hadn't made all of those poor choices up until now, if we hadn't gone through a messy divorce, if we hadn't filed bankruptcy, if we hadn't had an affair, if someone else hadn't betrayed us. When you look at it, it's a little tiny word that we're giving an incredible amount of power, isn't it? We allow it to thwart our potential in so many ways when, in essence, it could be filled with belief and faith and trust in a new beginning, a new tomorrow. IF we have the ambition, we can accomplish our goals. IF we have faith in God, He will see us through any circumstance. IF we put time and energy into a project, it can succeed. If I hadn't quit my job, I wouldn't have to worry about my finances right now. If I seek God first, He will provide for all of my needs. John 15:7 -- IF you remain in Me, and My words in you, ask whatever you wish and it may be done for you. 2 Corinthians 5:7 -- IF anyone is in Christ, the new creation has come! The old is gone; the new is here! John 14:14 -- IF you ask anything in My Name, I will do it. Jeremiah 29:13 -- IF you look wholeheartedly for Me, you will find Me. 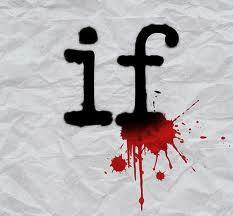 Those are some pretty powerful IFs, wouldn't you agree? Life-changing, goal-changing IFs. Don't let your fears stand in the way of becoming who you were meant to be. The potential that God has placed inside of us is so great, and each one of us has a purpose on this planet. We psych ourselves out and we ignore that gut feeling we have most of the time, and we have to stop doing that. We have to listen to our hearts and do what we're being called to do. Sure, it can be scary. Sure, there's always the chance that we're going to fail. But do you want to live in fear or do you want to do something incredible with your life? Sometimes changing your mind can be as simple as changing your mind. I've spent a great deal of time standing on the edge of the diving board over the last few months. It seemed my sanity was being tried more and more. I was filled with internal angst at every turn. I felt God pushing me toward the water, but I was afraid to jump. So, I dipped my toes in, felt that the water was icy, and backed away. Then, I sat on the side of the board, inching toward the safety of the cement walkway, as far away from the pool as I could get. And, finally, I stood up and did what probably appeared on the surface to be a bellyflop but, in the end, turned out to be an elegant jack-knife. My life is now a mission. As difficult of a decision as it was to make, I resigned my position at the magazine where I have been working for the past year. We were going in different directions, I felt, and I did not want to be a hindrance any longer. I'm certain it was the right decision, although the fallout won't necessarily be pleasant on either end. I know that God is going to take care of me, of our family, and I wholeheartedly trust in the path that He has laid out for us. We are, I know beyond a shadow of a doubt, exactly where we need to be in this very moment. He has provided at every juncture when we have trusted Him, and He will continue to do so in the future, I am certain. A Journey of Reinvention is going to become a non-profit organization with the goal of helping others at any cost: teaching life skills, budgeting, planting, sewing, recycling/reusing/upcycling -- anything and everything that will help people to get a leg up from poverty, sustain our resources, and give encouragement, inspiration, and faith to each and every person we come into contact with. Though the blog was established by me quite some time ago, the vision has grown into its current status through the collaboration of four ministry partners. In addition to myself and my husband, Steve, we are sharing a vision for missional living with Andie Kingsbury and Kevin Kingsbury, some close personal friends of ours and also some incredible, faith-driven local missionaries who are on fire for bringing God's Kingdom to Earth. Most of the time, when we encounter someone and have a conversation about God and Jesus and life and beliefs, we find much the same story as what we have had in our past. Raised in a church, we became jaded by judgmental people who inflicted rules upon us, made us feel 'less-than', and told us through their actions that we needed to change who we were so we could be 'good' in God's eyes. Or, we encounter people who have never believed or followed because the people they have heard be so vocal are filled with what seems to be hatred: racism, homophobia, judging and calling others sinners while claiming their own innocence, thinking and sometimes flat-out saying they are better than everyone else. Friends, this is NOT true Christianity. Our beliefs are plain and simple, as were the teachings of Jesus. Love people. Love them right where they are, for who they are, all the time, through flaws and failures, through betrayals and heartaches, because we are all children of God. He does not love one of us more than another for any reason. He does not love us more when we do more things 'right' or love us less when we do more things 'wrong'. The only thing that matters is that Jesus died for us -- each of us -- and we should treat each other with love and respect regardless of how we feel personally about someone. All have sinned and fallen short of the glory of God, the bible says, and one sin is not different from another sin in His eyes. It is not up to us to judge others, it is up to us to help and teach them, to love and grow them so that they see themselves -- and other people -- through the eyes of God. This is A Journey of Reinvention. We're flawed people lifting one another up, praying for wisdom and guidance, giving as much as we can every moment that we can to further the cause of Christ. Please join us, and bring your friends... and your enemies.